When you think of an airport, what’s the first thing that comes to mind? Perhaps, it’s a plane (if you’re being super literal), or do you think about the dreaded security lines? For others, it might be the overpriced, soggy, deli sandwiches or perhaps the crowded and loud gates waiting to depart for their dream vacation. For me, I think of networking. When I say networking I’m not talking about scoping out the well dressed business professional and coming up with a plan to strike a deal. Or buying a first class ticket to increase my chances of sitting next to a high powered executive with hopes of wowing them during our flight and signing a contract the next day. No, I’m talking about my roots that laid the foundation for my love of connecting with other human beings, exploring new languages and cultures and of course trying new foods! You see, since I was a little girl my parents believed that travel was one of the best forms of education and thus I spent quite a bit of time in airports. Some of my earliest memories while waiting to board a plane were watching my sister read countless books, watching my brother play video games and me scoping out interesting looking people to talk to. I would watch complete strangers body language (which at the time I had no idea I was doing) and march right up to them and ask very direct and often times completely inappropriate personal questions. From a very young age I was curious about people, their mannerisms and I wanted to learn about who they were, why they were there and I wasn’t afraid to do so. When I think about airports as a young kid, I have endless memories of wanting to talk, connect, and interact with people who I’d never met before. Whether it was inquiring about why two people were kissing and promptly asking if they were married or just boyfriend+girlfriend; or asking the flight attendants to let me pick up everyone’s trash, I craved human interaction. Trust me when I say that I would have continued to do this if it hadn’t been for my parents. They quickly realized that I had wandered off and then had to find me and apologize to the individual(s) I was bombarding with questions for their daughters’ behavior. Looking back I have a better understanding of the awkward and somewhat scary position I put my parents in. Wandering off in an airport and talking to complete strangers isn't every parents dream for their 4 year old daughter. 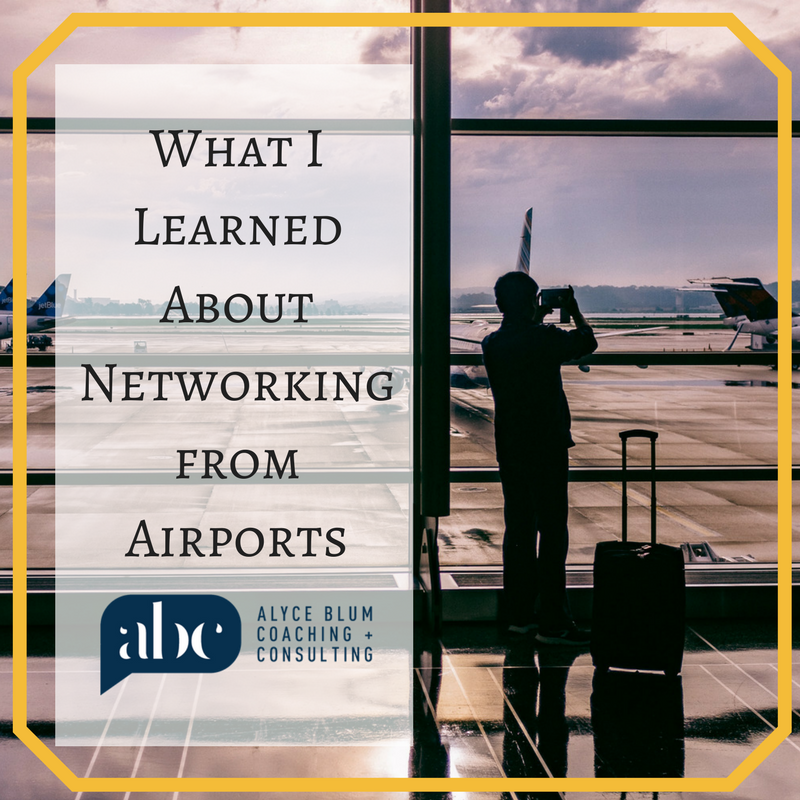 That being said it has become even clearer to me today that the tools and strategies I share with my clients to become strategic connectors are some of the very same tactics I used as young girl during these airport interactions. I’ve learned that being able to read other people’s body language and nonverbal cues in addition to learning how to control what our own body is ‘saying’, are some of the strongest and most effective tools that the greatest connectors rely on when networking. “Social psychologist Amy Cuddy argues that "power posing" — standing in a posture of confidence, even when we don't feel confident — can boost feelings of confidence, and might have an impact on our chances for success. Body language affects how others see us, but it may also change how we see ourselves.” I’m a huge fan of power posing and if you’re unfamiliar with this concept or want a refresh I highly recommend that you watch Amy Cuddy’s Ted Talk: Your Body Language May Shape Who You Are! As a young girl I wouldn’t just go up to any old stranger...no I was more ‘strategic’ than that. I would choose people who were smiling, laughing, talking to others, hugging or even kissing someone else. What does this tell me and you about networking today? It tells us that as human beings we are drawn to people that aren’t standing alone in a corner with their arms crossed over their chest and carrying a frown across their face. Whether we’re a four year old little girl or a grown adult we are drawn to people who are smiling, showing signs of affection and warmth. The networking lesson we can apply to our lives today is simple: If you want to make a good first impression, regardless if you’re at a networking happy hour or waiting to board a plane be cognizant of your own body language and what it’s saying to the outside world because you never know who is watching and who might come up to you and strike up a conversation! When you think back to being a kid do you have any memories of interacting with people in similar or different ways than how you approach people today? Take a few minutes to think about this and if anything interesting comes to mind I’d love to hear from you by sharing your thoughts and feedback of this blog on my facebook page here!